I’m happy to report that it’s coming along pretty well, yah! The swelling is way down, and so is the pain. But, I’m still on crutches and can’t sit very well because of a big brace that doesn’t bend much for now — the doc has it set on 30 degrees bend. It goes from just above my ankle all the way up to my thigh. Makes it where I can’t stamp very well. :( Hopefully that will change when I go back to the doc on Friday. Fingers crossed. I’ve really missed all of you — and stamping too! So for the next few days I thought I’d share some cards that I did for Hero Arts before I had surgery, starting with this cute chicky! She’s from one of the the new Hero Arts and BasicGrey stamp sets in the Picadilly line — love this line so much, it’s really happy and fun! (Coming in October!) Check out the whole line on pages 6-7 of the digital catalog. I used one of my favorite techniques on this card — coloring a stamp with water-based markers, misting it lightly, and then stamping. Oh how this makes me want to stamp! Now, how have you been? Is summer winding down where you are? It’s still super hot here! Hello! Good to hear you’re on the mend. Best wishes for your continued recovery! Julie Kirk recently posted..Overheard: Do mythical creatures sweat? Julie Ebersole recently posted..A Muse Studio – On The Road, comin’ to GA, SC, NC, and VA! I’ve been so busy with work and family stuff – this weekend was the first time in a long while that I got to get crafty, so I know what you mean about missing stamping! I hope you’re back to it soon! Wishing you a full and speedy recovery, Lisa! Hugs! Hope you’re feeling lots better really soon! It’s hard to wait sometimes to get back to the old routine, but it makes me appreciate it when I do! We’ve been plagued with lots of severe storms with high winds and lots of rain…causing power outages (36 hrs.once) and wet basements! No trees fell on our house or our cars and we are grateful! I guess summer is winding down and going out with a bang!!!! I will wish for good news for you this week when you visit the doctor! Hi sweet, Lisa! So good to hear from you and glad to know your knee is starting to heal! Love your adorable card! We’ve had a couple of days now with cooler temps and it feels great! I wish I could send you, not only lower temps, but some rain too! I know what a horrible drought Texas is in right now. Barb recently posted..Just Starting to Snow. . .
great to see cards from you. hope you are recovering well. take care! Great to see some Lisa-whimsy again! This card totally makes me smile :) So does the new tagline in your header….glad you came through that episode with your sense of humor intact. Praying for good news from the doc and that you’ll be creating your sweet cards again soon. 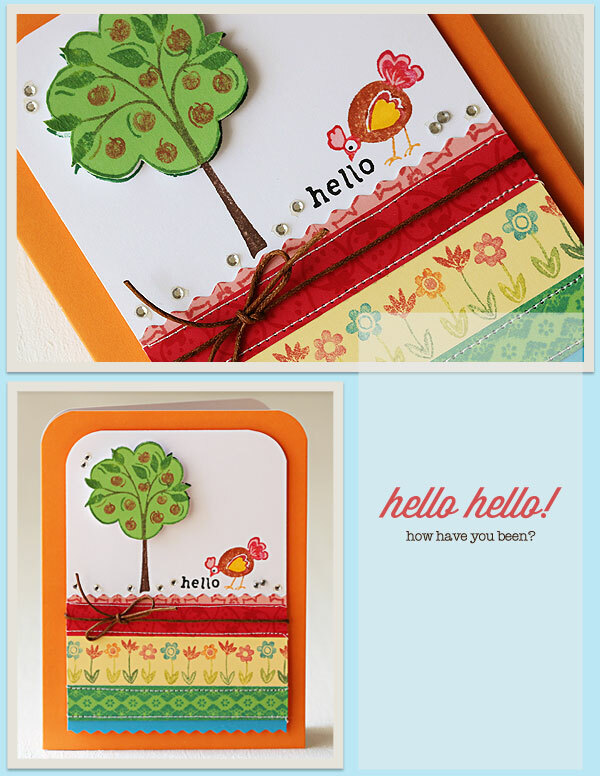 nancyljk recently posted..Lily Pad Cards, The Greeting Farm and Lucy’s Lovely Lines….. Your card instantly reminded me of a childhood board game called Hi Ho Cheerio! For movies, how about My Cousin Vinnie or The Wedding Singer? Ah! This is sooo very sweet Lisa, I love it! That tree is precious!! Hi Lisa! Thanks for sharing your beautiful card. Still have the kiddies home for two more weeks although life will be a little easier with my 16-year-old away at camp this week. Still lots of heat and humidity here as well as rain. To escape all of that, I took my daughter to see One Day today. I recommend you bring tissues if you see it! Hope you are up and around soon! Good to hear from you, Lisa, I have been wondering how you’re doing. Wising you continued healing and a return to “normal”. We had a return to cooler weather here for the last week or so – heaven! I don’t know how you stand that heat!! Sending smiles! Hi Lisa! Sending you healing hugs as you recuperate from your surgery. Hope you’ll be stamping again real soon! Love the little chickie–super cute card! Take good care! so glad to hear that you are on the mend and hope it heels well so that you can stamp like you used to soon! and your card is so cute! love the fun colors! i am reading A Tale of Two Cities now. I don’t know if you like listening to radios, but i am in love with “WNYC’s Radiolab,” you can find it in the iTune Store and subscribe for free. they always have really fun and fascinating stories. hope you have a wonderful week and hope all goes well with the check up. big hugs! Lisa, I’m delighted to hear you’re doing well:) Hopefully Friday will bring good news and a better stamping position for you too! Your card is adorable! Wonderful mix of pps and the little chick is so cute! Looks like you’ve been having fun playing around with your blog – it looks great! We’ve had a fairly cool and somewhat wet summer, so no winding down to be done here! I just finished reading The Secret Scripture – very good book but not exactly a cheery read. Watched North Face last night, again great film but not a funny one. Off the top of my head I’d recommend Bill Bryson’s A Walk in the Woods (must read it again) and Sideways. kathy (krolski) recently posted..Little Critters….